Like a fairytale kingdom floating over the Tiber River Valley, Civita is one spot on earth seemingly untouched since medieval times. Perched on a pinnacle of tufa rock high above a vast canyon, erosion and earthquakes over time caused parts of this once prosperous village to tumble into the valley below. Formerly attached to her sister city Bagnoregio by a saddle of land, Civita is destined to eventually perish but stubbornly refuses to let go. My experience with Civita is short but holds lasting impressions. A footbridge 900 ft. long crosses the chasm and leads up to tall medieval gates. The view of the canyon below reminds me of a lunar landscape. Evidence of fallen chunks of earth and tufa surround the valley, leaving deep grooves that mar the landscape. The entrance to the village is a massive stone passageway cut through rock by the Etruscans 2500 years ago and embellished in the 12th century with a Romanesque arch. As I pass under the archway, my feet touch down on old stone. Ivy crawls up walls and drapes over old archways. Pots of red geraniums line stairs and balconies. All is quiet but the occasional drip of the swirling grey mist. Down the street, I notice a Renaissance palace on the piazza with only a facade. The rest of the house broke off and fell into the valley far below years ago due to the erosion of the hill. Windows reveal the sky instead of curtains. 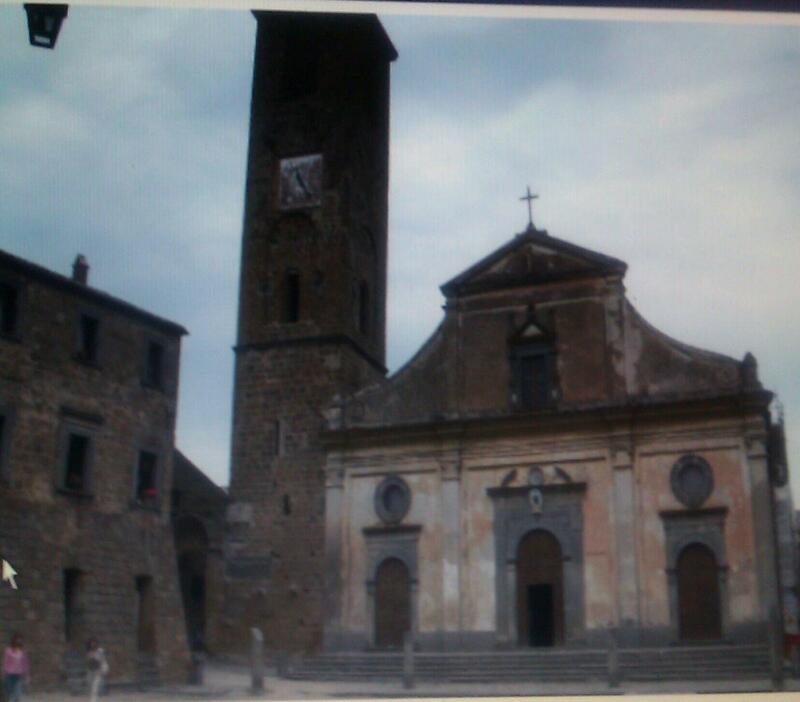 A church on the main piazza is originally the site of an Etruscan temple that became a Roman church. Tall pillars across the front stand as a reminder of those early pagan shrines. 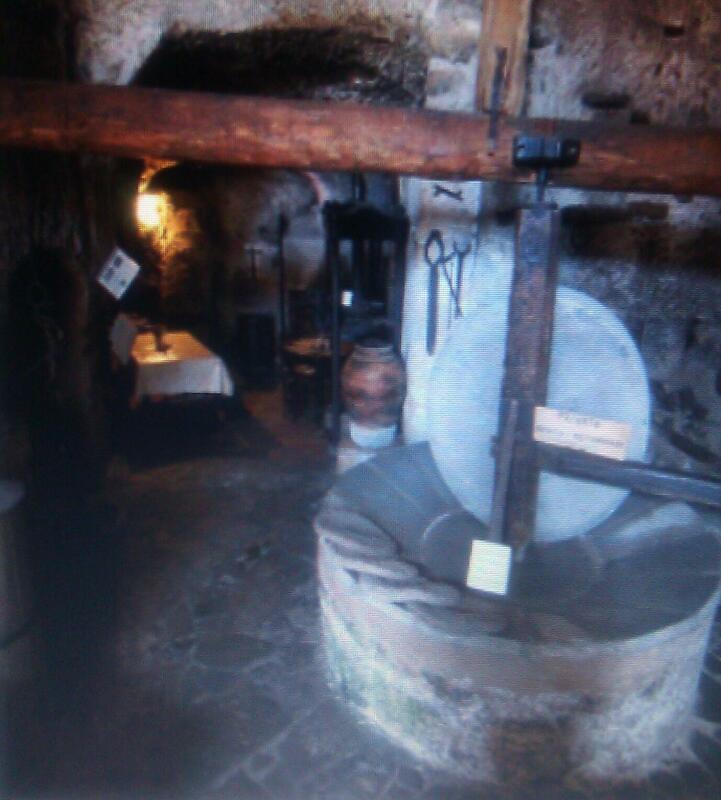 The ground beneath Civita is honeycombed with ancient cellars and cisterns. Some have existed since Etruscan times and are still used for storing wine and collecting rainwater. During World War II, a bomb shelter was made inside a pre-Roman tunnel. The late afternoon grows cold and damp as I explore the further reaches of Civita. Following a pathway just down from the village, I find a small cave-like taverna with a warm fire illuminating the dark interior. The warmth draws me in. A 1500 year old olive press stands inside the doorway, once operated by blindfolded donkeys. A young friendly man greets and seats me at a small table by the fire. Slices of bread are toasting on top of a grate over lapping flames. Shadows dance on the walls as the smell of hot bread and garlic fill the room. Sipping a glass of red wine, I watch as the bread is taken from the hearth. An olive tapenade is spread liberally on the garlic-rubbed bruschetta and placed before me. Maybe it is the combination of drizzling weather and the warmth of the open fire, or that it was hours since I had eaten. Possibly it was the entire magical experience of Civita. Whatever the reason, the rustic goodness was unforgettable. 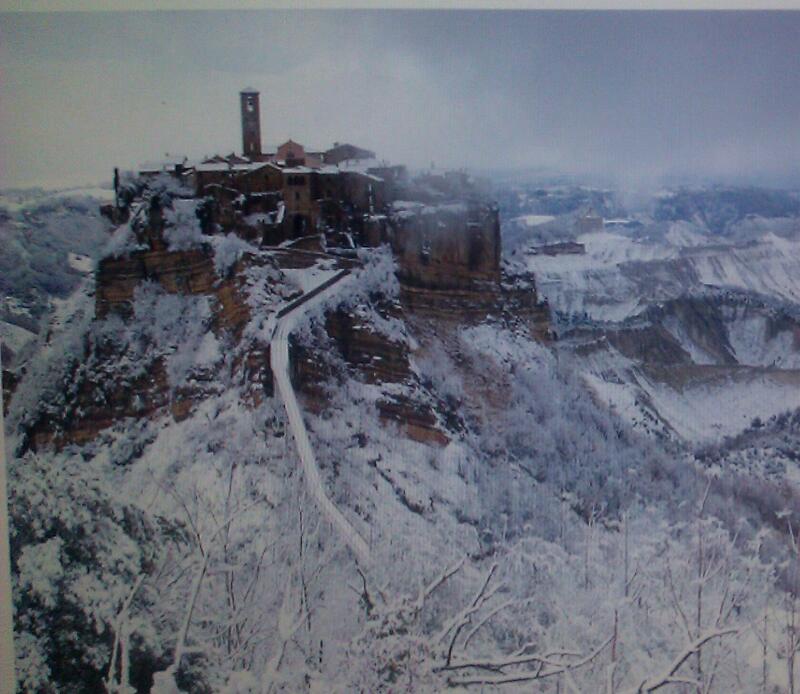 Civita, looks so intriguing. I love how it is perched up high so that there is a view from every outer window. An exciting wonder and more. The view from below and from above I bet was totally incredible. Thanks for a thrilling adventure. Lizzie, thank you! I am so glad that you are going, and would love to hear about your experiences when you get back. By the way, I believe there is an entrance fee now. Just FYI…so worth it, and I hope a way is found to keep Civita from disappearing! Lovely post, Susan. Did you notice how steep that bridge becomes, never quite evident from a photo? Not great for vertigo sufferers, either! Thank you! Yes, it gets very steep toward the end before entering the village. I looked down into the valley below just long enough to get a good look. Not for the faint of heart!! Thank you, Susan, for this read of a magical journey (I shared). I wonder how life was like back then and the challenges it took to build such a place that still stands today. Truly a testament to the strength of the hard labors of man and endurance and the wonderful gift of love in the warmth of a fire and refreshments. Thank you for your comment Pat. I wonder the same things…how life was like, the challenges they faced….so much history has come and gone during it’s existence. It’s quite an unusual find.. It does sound like it was an unusual find, Susan. I’ll bet as you stood there, you could almost hear the sounds and feel the energy of the times. Like minds think alike. 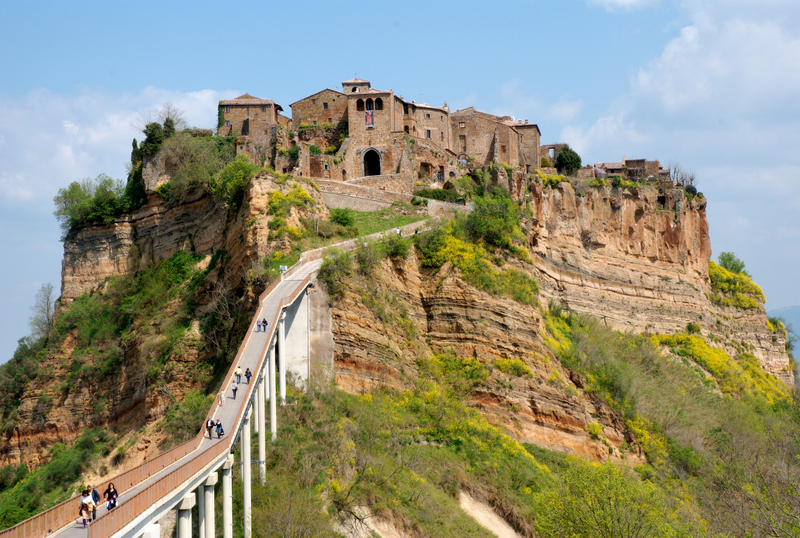 I did a post, with video, on “Civita di Bagnoregio: Life on the Edge” a while back. Nice article on your part. Thank you….yes, it is definately worth a visit. But go on a cool misty day and find that cave with the warm fire and toasting bruschetta!! 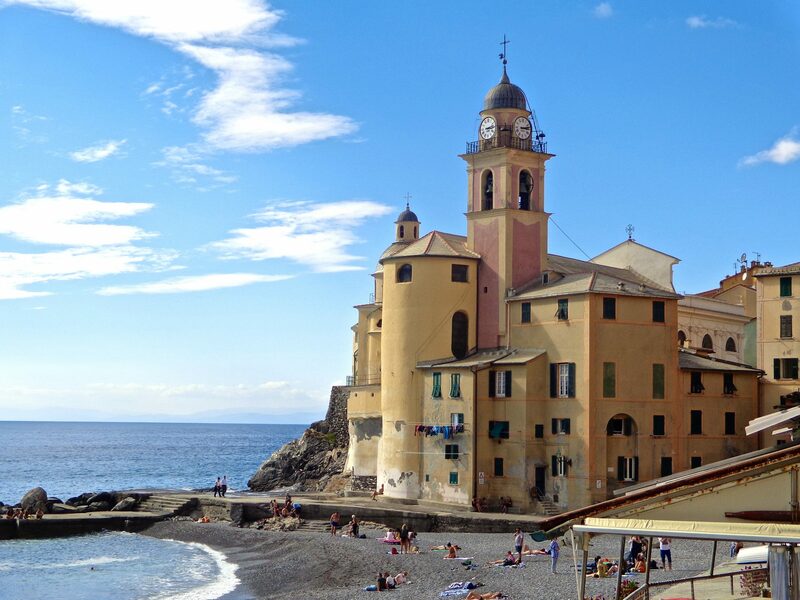 Great post, Civita sounds like a wonderful place, especially the footbridge! Thank you! It is a fantastical place….almost unbelievable!! Keep following my posts….I promise you will stay entertained!